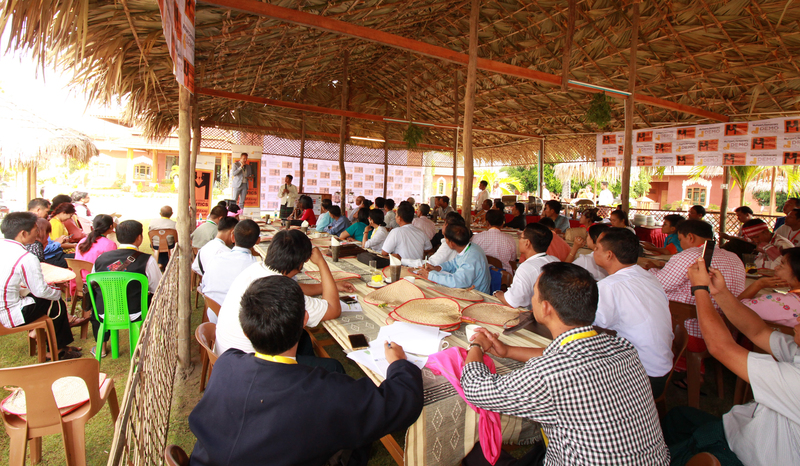 The 6th edition of the Myanmar School of Politics (MySoP) Alumni Weekend started on November 25th in Bagan, Myanmar. Entitled ‘Federalism: Facts & Fantasies, the Weekend brought together close to 120 high level politicians from over 30 different political parties, all former and current participants of MySoP programmes. Trainers included Indian Ambassador to Myanmar Mr. Vikram Misri, Nigerian author and commentator Ms. Kaine Agary, Malaysian professor Mr. Jayum Anak Jawan, and Myanmar’s very own Mr. Myat Ko Ko. Dutch Ambassador Mr. Wouter Jurgens opened the Weekend with a short speech noting the importance of building an inclusive democracy and the inspiration the multiparty audience at the Weekend gave him. Acknowledging the current challenges to Myanmar’s democratization process, he encouraged participants to persevere, paraphrasing John F. Kennedy’s words that at times someone needs to take on an important challenge ‘not because it is easy, but because it is hard’.